Since camera manufacturers continue to annoy me with their unwillingness to add the features I want (yes, I’m taking this personally) I guess I’m about due for another blogpost ranting/whining about it. I’ve covered some of these things before in this blog (and quite often on the This Week in Photo podcast) but it seems worth having an up-to-date list of some obvious stuff. Let’s set the ground rules first. I’m not going to be talking about radical scientific breakthroughs here. ISO 1billion at 100 Megapixels (capturing a dynamic range that includes both coronal activity on the sun and shadow details on a piece of coal… all in the same photo) will be cool, definitely. But there’s some fundamental physics that still need to be dealt with before we get there. No, all I’m asking for today are engineering – often software – features. Things that really only require desire/resources and design/integration. At this point it’s no secret that more people take photos with their phones than with dedicated cameras. Obviously the main reason for this is because The Best Camera Is The One That’s With You, coupled with the paradigm-shift that comes with network connectivity to friends and social networks. As an iPhone developer I know how crazy it would be to create a fun app – even one as fun as FreezePaint – without including the ability to share the images to Facebook/Twitter/Flickr/Instagram once they’ve been taken. But beyond all that, what else does a ‘camera’ like the iPhone give us? Tons, really, and the bottom line is that you can do photo things with your phone that no ‘traditional’ camera can touch. (And this in spite of the fact that the iOS development environment is woefully poor at giving deep-down access to the camera hardware). Because camera phones are an open platform, unbounded by a single company’s vision for what a camera can or should do. First, a few more basic wishlist items on the hardware side of things. With network and remote communication in place, all sorts of things happen. The ‘sharing’ stuff mentioned above of course, but also things like remote control of the focus and shutter via my phone (because the phone is getting a live video feed directly from the camera’s sensor). Seriously, take a look at this little beauty of an app for controlling an Olympus E-M5 via iphone. I love the features it supports. Timelapses with accelleration. Take timelapse photos based on distance moved (i.e. every 50 feet or something). Sound-detection to trigger shutter. Etc. Only bummer is that it requires extra hardware on both phone and camera to communicate. What else does having a networked camera give? Hopefully I can buy flash devices that talk nicely too, via some standard transport like bluetooth or WiFi. Radio Poppers and Pocket Wizards are great but these are professional-level tools that are way overkill (and overpriced) for what I need most of the time. I just want to hold my camera in one hand and a flash unit (no bigger than a deck of cards, hopefully) in the other hand, extended off to the side to give a pleasing angle on the subject. (Brief tangent on lights: For a lot of closer-up work (not to mention video), it sure feels like continuous-light LED sources are starting to be a very viable alternative to xenon flash devices. These too need to get remote-control friendly – take a look at the awesome kickstarter-funded ‘Kick’. Sure would be cool, too, if I could buy a light/flash that could take the same batteries as my camera…but I’m getting way off-topic now). — Sensors. In this situation the word ‘sensor’ refers to all the auxiliary data that you may want to collect, i.e. accelerometers and gyroscopes and altimeters and compasses and GPS units. Phone’s already got ‘em – put those in my camera too, please. If you add it (and allow programmatic access to it), all sorts of cool things will start showing up, just as they have on phones. For example, use information from the accelerometer to measure the camera’s movement and snap the photo when it’s most stable. These accelerometers are sensitive enough that they can probably measure your heartbeat and fire the shutter between beats. (It’s also worth noting that the main difficulty with algorithmically removing motion blur caused by camera shake, usually via deconvolution, is because of the uncertainty about exactly how the camera moved while the photo was being taken. If we were to record accurate accelerometer readings over the duration of the time that the shutter was open and then store that in the EXIF data, it suddenly becomes much easier to remove camera-shake blur as a post-process). Combine GPS with network connectivity so my camera’s positional data can be at least as accurate as my phone (i.e. A-GPS). Also toss in a compass. Yeah, there will be a battery-drain penalty if I have all these sensors and radios operating constantly. Big deal. Let’s see how much a Canon 5DmkIII battery goes for on ebay these days… Oh look – about TEN DOLLARS. For that amount I think I can manage to have a few spares on hand. Finally, for the super-geeks, it sure would be cool to get access to the hardware at a really deep level. I’m talking stuff like allowing me to play with the scanning rate of the rolling shutter, for instance, if I want to make some funky super-jellocam images. Okay, let’s dive into software-only stuff. Here are a few things that would be almost trivial to implement if I had even basic programmatic access to my camera’s hardware. — Allow me to name files sensibly and according to whatever scheme I want. Right now I rename my images as soon as they’re loaded onto my computer (based on the day/time the photo was taken) but why can’t my camera just do that for me automatically? And do it according to any scheme I care to specify. — Timelapse/Long Exposure. This is such a simple feature from a software perspective yet many (probably most) cameras still don’t support it. For my DSLR I need to buy an external trigger with timer capabilities. Why? (Other than the obvious answer, which is because it allows the camera manufacturers to charge a ridiculous amount of money for such a remote trigger. Hint – buy an ebay knockoff instead). — Motion detection. It’s a easy enough algorithm to detect movement and only trigger a photo when that occurs. Yes, this would make it easy to set up a camera to see if the babysitter or the house-painters wander into rooms they shouldn’t, but it would also be very interesting to use with, for example, wildlife photography. — Let me play with the shutter/flash timing. Allow me to do multiple-flashes over the duration of a long exposure, for instance, to get interesting multiple-exposure effects. — Give me programmatic control over the autofocus and the zoom (if it’s servo-controlled), so I can shoot bracketed focus-points or animate the zoom while the shutter is open for interesting effects. I mean Lytro [link] is cool and all, but most of the time I don’t want to radically refocus my image, I just want to tweak a slightly missed shot where autofocus grabbed the bridge of the nose instead of the eyes. If my camera had automatically shot 3 exposures with focus bracketing I’d be able to pick the best, but also I’d be able to use some simple image manipulation to stack them and increase the DOF. Actually, let’s talk about that a bit more. Voice-control for taking a photo may not be all that exciting, although I can certainly see situations where I’m trying to hold my camera in some strange position in order to get a particular point of view and the shutter-button has become difficult to reach easily. (Example? Camera on a tripod that I’m holding above my head to get a very high angle, with LCD viewfinder angled downward so I can see the framing.) Where’s my voice-activated Digital Camera Assistant when I need her? But beyond that, think about all the camera settings that you normally have to dig through a menu to find. Custom-programmable buttons & dials are great, but there’s always going to be a limited number of them. Being able to quickly tell the camera to adjust the ISO or turn on motor-drive (AKA burst or continuous mode) just might make the difference between getting the shot and not. Finally, there’s a whole huge variety of general image-processing operations that could be applied in-camera, from custom sharpening algorithms to specialized color-corrections to just about anything else you currently need to do on your computer instead. HDR image creation. Panoramic stitching. Tourist Removal. Multiple-exposures to generate super-resolution images. Etc., etc. Are some of these better done as post-processes rather than in-camera? Sure, probably. But you could make the same claim about a lot of things – it’s why some people shoot RAW and others are happy with JPEG. Bottom line is that there are times where you just want to get a final photo straight out of the camera. Better thing to do? Shoot an exposure-bracket of the scene and combine them (after auto-aligning as necessary) into a true high dynamic range image. Save that as a high bit-depth TIFF file or DNG or (better) OpenEXR or something. You can give me the jpeg too if you want, but don’t throw away all the useful data. In other words, let me work with HDR images in the same way I work with RAW images because that’s exactly what a RAW file is… a somewhat limited high dynamic range file. This mentality is the sort of thing I’d like to see for all sorts of in-camera software algorithms – give me something useful but don’t throw away data. I could probably list dozens of additional image-processing algorithms that it would be cool to have in my camera (not to mention video-related tools). Some of the features mentioned above may not feel terribly important or may even seem ‘gimmicky’, but all it takes is a single special-case situation where you need one of them and you’ll be glad they’re part of your software arsenal. So who’s going to make a camera like this this? Who’s going to make the hardware and who’s going to make the software/OS? In terms of hardware I’m betting it won’t be Canon or Nikon – they’re too successful with their existing systems to create something as open as what I’m describing. Probably not Sony either – they’ve always relied on proprietary, closed hardware too (look how long it took for them to realize that people were avoiding their cameras simply because they didn’t want to be tied to the Sony-only ‘memory stick’). I guess I’m hoping that someone like Panasonic or Olympus steps up to the plate, mostly because I love the Micro 4/3 lens selection. But maybe it will be a dark-horse 3rd party – a company that sees the opportunity here and is willing to invest in order to break into the digital camera marketplace with a huge splash. Might even be someone like Nokia – does the recent 41 megapixel camera phone indicate a potential pivot from phone manufacturer to camera manufacturer? In terms of software I know I’d love to see a full-featured camera running iOS, but realistically I suspect that a much more likely scenario is that we’ll get a camera running a version of Google’s Android OS. Or hell, maybe Microsoft will step up to the plate here. Crazier things have happened. But bottom line is that it sure feels like someone is going to do these things, and hopefully soon. And then the real fun will start, and we’ll see features and capabilities that nobody has thought of yet. So you tell me – If you had full software control over your camera what would you do with it? I’m so with you on this subject. 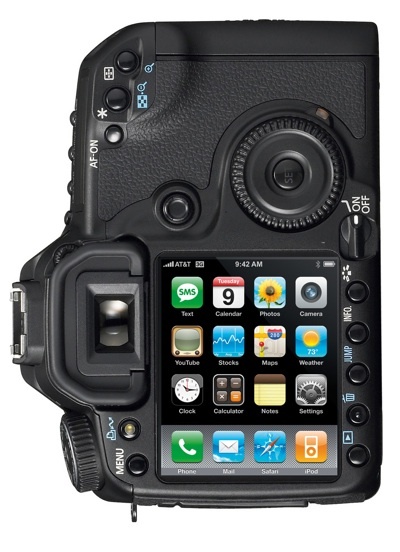 Interchangable lens camera with an Android or Iphone OS is the future. It’s just a matter of time before we have these devices. And with recent announcements of Android/Camera devices like Samsung and Nikon who knows … it may be sooner then later that we can do some awesome programming magic with our cameras. I use this on regular basis to get a decent image into my phone for post and publishing.